Here's the dilemma; you ride the road, but rubber neck at every off-road path as you pedal by. You enjoy riding the dirt, but don't necessarily dig the hassle of packing up and driving to the trailhead. The Niner RLT 9 4 Star bike just might be your solution. As Niner's first bike designed for 700c wheels, the RLT 9 was intentionally built for the curious and spontaneous. If you mainly stick to pavement and fire roads you can use 700c wheels to run road or cross tires, or if you want something a little wider (up to 1.75") you can slap on a pair of 29" wheels thanks to the 142x12mm rear hub spacing. The slightly longer chainstays, slightly lower bottom bracket, and a slacker head tube angle make this a real gravel grinder that's ready to be whatever kind of bike you need it to be. To make this a bike one you can truly ride on and off road all day, the RLT 9 features a hydroformed tube set similar to that of Niner's Air 9, engineered to meet Niner's ride quality standards which is also why it comes with a gravel-tuned, custom painted Niner Carbon fork to gobble up all those road and "not-road" vibrations. The RLT 9 features internal cable routing for a Di2 setup and uses a PF30 bottom bracket shell allowing you to run it geared or single speed via Niner's new BioCentric 30. Race a proper cross on Saturday, spin the back roads on Sunday, and commute on Monday. The RLT 9 is exactly what you'd think of when hearing Niner made a 700c drop bar bike: beautiful, versatile and ready to spar! Custom 15mm gravel-tuned Niner carbon fork shares DNA and safety testing standards with Niner's legendary MTB version. 142x12mm rear dropouts can fit a wide variety of wheels and provide a solid platform for efficient power and control. More upright geometry features slightly longer CS, lower BB and slacker HT angle, offering long-lasting comfort. SRAM Apex hydraulic disc brakes Keep you in total control no matter the conditions. 5'1" - 5'3" 5'3" - 5'5" 5'5" - 5'9" 5'9" - 5'11" 5'11" - 6'3" 6'3" - 6'5"
Great bike, better than the Specialized Diverge. Better value and more comfort. As a loyal JensonUSA customer, I accidentally came across this great deal. 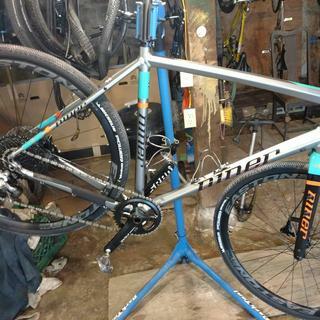 I had thought about getting another gravel bike to replace a Diverge that I had sold a while bike. I was looking at this SRAM build vs the Ultegra build and decided to try the more simple 1x system like all of my MTBs have. This was my first bike from Jenson. I ordered this on a Thursday and received it two Tuesdays later. Other than setting the bike up, all it needed was to install the front wheel and tighten stem. I'm glad that the setup was Tubeless setup and my kit included valve stems. The tubes that came in the wheels had the shortest valve stems ever and you could barely put air in them, but no big deal as I converted to Tubeless after one ride. I also had to adjust a dragging front brake. Compared to the Specialized Diverge I had, this bike is waaayyy more comfortable including how it handles bumps in the road. It is also a way better value and I would never consider another bike of any kind without hydraulic brakes as they are world's better than the mechanical brakes that were on my Diverge. Buy this bike from Jenson! I just rode the Tour de Tucson on mine, a 102 mile road bike ride. It's the Apex 1x with 11-42 cassette. I usually ride it on gravel, but put 28mm road tires on it for the tour. It was so good, I'm going to sell my Cervelo R3 and have one road/gravel set up that I switch tires or even wheelsets out on. This one is all you need. It is a bit stiff sometimes. 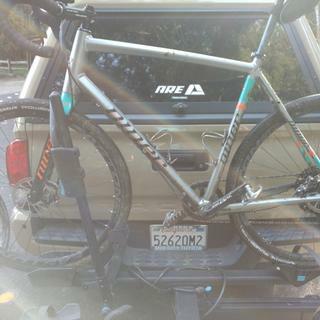 Super stoked about the Niner RLT9. I'm always apprehensive about purchasing a complete bike from am unfamiliar bike company because of bike fit bit I couldn't be more stoked on the Niner RLT9. This bike is so much fun, handles great, and is perfect for all the gravel adventuring I've thrown at it. BEST ANSWER: Based on the Easton website they are 24 mm external and 19 mm internal rim width and tubeless ready. The photos show Apex crankset and shifters, however, the specs say those parts are Rival. Which is correct? What is the weight of this bike? BEST ANSWER: They are tubeless ready. Does this bike have front or rear eyelets?